Two Seaman-related trademarks have been registered in Japan, possibly hinting at sequels for the Wii U or 3DS. Of all the off-beat, bizarre videogames out there, Seaman probably takes first prize for strangeness. 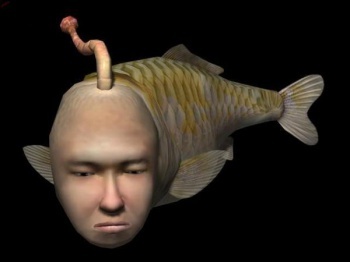 A Dreamcast pet simulator that used a microphone attachment for communication, Seaman challenged players to raise a crass and deprecating fish with a human face, even as it insulted you in the process. The game failed to take off in North America, but remains the third best-selling Dreamcast game in Japan, and even attracts morbid curiosity from today's gamers. Perhaps that interest is what inspired designer Yoot Saito to push for a handheld re-release, and the effort could finally be paying off. Nintendo has registered two trademarks that suspiciously sound like Seaman revival attempts, or something frighteningly similar to it. The trademarks are Mysterious Pet: Legend of the Fish With A Human Face and Mysterious Partner: Legend of the Fish With A Human Face. Given that the number of fish with human faces in gaming is noticeably small, revisiting Seaman is a strong, if speculative, possibility. That said, while Shigeru Miyamoto admitted that Nintendo needs new franchises, I doubt anyone thought Seaman was what he had in mind. If a Seaman game were to be developed, either the Wii U or 3DS would be appropriate platforms thanks to their built-in microphones. I'll even admit that the touchscreens could provide interesting gameplay opportunities, although I suspect that Seaman wouldn't appreciate the interactions. Whether we turn our televisions into creepy fish tanks, or carry a Seaman in our pocket, will now depend entirely on where Nintendo goes from here.